Thanks to Avengers: Infinity War, Thanos is currently the reigning king of the Marvel Cinematic Universe. However, a Marvel super fan decided to take their love of Thanos and mix it with McDonald's character Grimace and there may be a new king of the MCU (McDonald's Cinematic Universe). The result is pretty awesome and has some Marvel fans flipping out online while making a bunch of different snap jokes. The mashup cosplay actually makes a lot of sense since Grimace was first known as the Evil Grimace when he was introduced in the early 1970s. The Grimace and Thanos cosplay was created by Twitter user Kittie Cosplay, who calls him Grimos. Grimace is shown wearing the Mad Titan's armor and he has an oven glove as his Infinity Gauntlet. 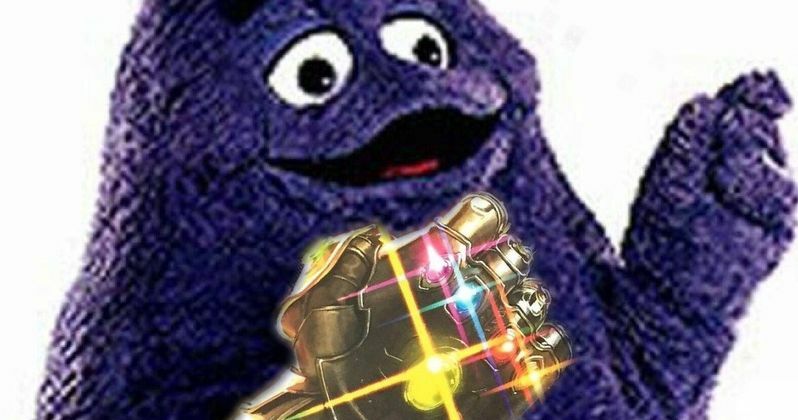 Instead of Infinity Stones, Grimos has rainbow colored Chicken McNuggets and he appears to have collected all of the Infinity Nuggets. Who knows what Grimos will accomplish with the snap of his fingers. One can imagine that it won't be as evil as what Thanos pulled off in Infinity War though. The Thanos and Grimace cosplay is definitely one of the best costumes in recent memory and will certainly turn some heads at San Diego Comic-Con this year. One can imagine that there will be a lot of pictures taken with Grimos in a few weeks, leading to the power spreading. If you run into Grimos, make sure you leave his oven glove alone. Do not attempt to liberate any of the Infinity Nuggets from the gauntlet. The character already made it out of Monterey Comic-Con without incident, but that convention is nowhere as big as the San Diego convention in a few weeks. The origins of Thanos have been well documented over the last several months, thanks to the crazy success of Infinity War. However, not much is known about Grimace. The character originated in 1971 in print ads for McDonald's and was initially a villain who used his short purple arms to steal milkshakes. The character also had two sets of arms at that time as well. He was later transformed into a good guy with two arms as the clumsy friend of Ronald McDonald. He isn't the smartest of characters, so it would be pretty interesting to see what happens when he snaps his fingers with all of the Infinity Nuggets in his possession. Grimace has an unnamed mom, an unnamed dad, a grandma named Winky, a great, great grandma named Jenny Grimace, and a possible brother named King Gonga, who apparently rules over all Grimaces. At least he did rule until Grimos came along. The Thanos and Grimace cosplay gives Grimace the power and respect that he has deserved for years. All we need now is a spin-off movie with Grimos teaming up with the Hamburglar to go up against Ronald McDonald. You can check out the epic and creative Thanos and Grimace mashup below, thanks to Kittie Cosplay's Twitter account.